Francesco's is the number one rated accommodation from hostelworld travelers in all of Ios, and with good reason, just take a look at the sunset view from our terrace bar at your right, that's what you could be enjoying your cocktails to each evening during your stay in Ios. 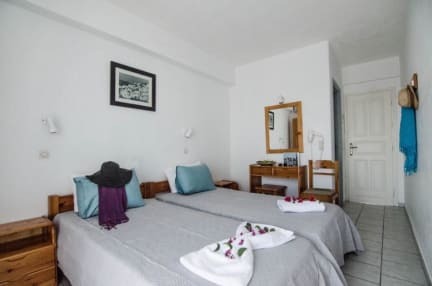 We are located in Ios town, just a short stumble from the night life in the main square and a 10 minute walk from the main beach. There are also six other beaches within comfortable walking distance. There is no need to have a long, dark walk home at night after your bar hopping adventures. There is an air-conditioned terrace bar with satellite television and breakfast café which overlooks the port, beach, and one of the best sunset views on the island, as you can see in the photo. All guests are invited for a free welcome drink and a chance to meet fellow travelers in our friendly bar to start their first night on Ios. None of our guests ever pay the cover charge at the famous Ios Blue Note, one of the most popular clubs on the island. Some of the amenities which are offered at Francesco's include 24-hour hot water, a new reception area with internet cafe, tourist information and information on boat and plane tickets etc. , and all guests are encouraged to make use of our free safety deposit boxes. We also have an extensive travelers book exchange and no curfew or lock outs to disrupt your night or day. After you make your booking with us all you have to do is either e mail or call us with your boat details and our driver Matthew will pick you up from the boat free of charge, and also drop you off when you are leaving, which is also for free. Camera accogliente e pulita con aria condizionata. Personale cortese e disponibile. Il posto è carino, i servizi sempre puliti, è un posto giovane e la gente che lo frequenta è prevalentemente votata ai party notturni. Spotless room with amazing terrace and view. I enjoyed spectacular sunsets. Excellent location in center, right in the old town. Alex pick you up at the port and in the five minutes required to bring you to the hostel gives you every information: where is the supermarket, the bus station, the backery....and how don't go lost .... Finally, Maria gives you a really warm welcome. It's a wonderful accomodation with a wonderful staff.